While the mining industry has profited from a lift in commodity prices and China’s infrastructure growth plans, challenges continue. These difficult conditions could be considered the “new normal,” according to a recent report from the World Economic Forum. However, the report continues, digital technology has the potential to help mining companies contend with these conditions—and it could help the industry generate a benefit of $190 billion over the next decade. 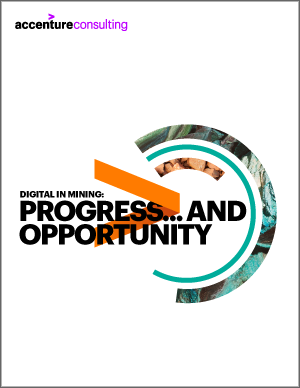 A recent Accenture study indicates that mining companies are indeed investing in digital technology to help them move forward. The study looked at where miners are making those investments, and where they plan to make more. As a result, it sheds light on how the industry is using, and not using, digital technology to improve decision making, increase efficiency and productivity, and succeed in a challenging environment. The power of digital to drive innovation is well recognized by business leaders and 46% believe it’s the biggest factor in driving innovation. Mining companies are applying digital technology across their organizations, but they are embracing it most heavily in mine operations. Technologies miners are leveraging most in mining operations include robotics, automation, remote operating centers and even wearables. CYBERSECURITY, REAL-TIME DATA VISUALIZATION AND REAL-TIME ANALYTICS ARE THE MOST WIDELY USED DIGITAL TECHNOLOGIES ACROSS MINING ORGANIZATIONS. 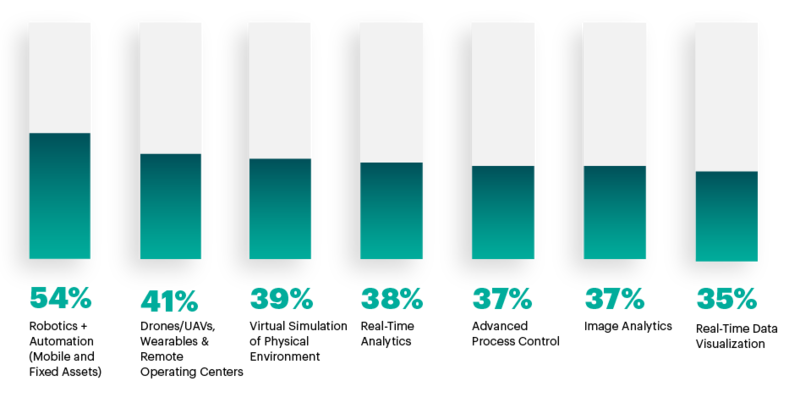 INFORMATION TECHNOLOGY (IT) AND OPERATIONAL TECHNOLOGY (OT) INTEGRATION IS WELL UNDERWAY, WITH 46 PERCENT SAYING BUSINESS DATA IS MANAGED BY A COMBINATION OF GROUPS, AND 33 PERCENT SAYING OPERATIONAL DATA IS MANAGED IN A SIMILAR FASHION. On an operational level, executives most often cited better equipment performance (47 percent), operational/administrative cost savings (42 percent) and better decision making (40 percent) as top benefits. When asked about overall business benefits, executives most often cited improved workforce productivity, especially from mobile/tablet devices, automation, visualization and the ability to simulate physical environments. Technology is the enabler, but achieving real value depends on how the business leverages the technology. If companies are satisfied with the value they are seeing from their investments, it boosts buy-in and interest—and that, in turn, can help drive success and sustained results from the growing use of digital technology. Accenture conducted an online survey of 201 C-level and top management executives and functional leaders in the mining and metals industry. The survey was fielded in mid-October through mid-November 2016 and included respondents from Australia, Brazil, Canada, Chile, China/Hong Kong, Indonesia, India, Singapore, South Africa, United States and United Kingdom. Amy Callahan is a Managing Director with extensive experience in driving transformational improvements across organizations in the areas of supply chain, asset management for owner-operators, and operations. Her experience spans across organization models, operating models, business process, and both information and operational technology. She has 20 years of experience in management and operations consulting with her primary expertise in asset intensive industries such as mining, oil & gas, chemicals and utilities. Amy in based in Denver, Colorado. George Long leads Accenture’s Digital Transformation in Mining program. He has more than 10 years of consulting experience applying digital applications across industries, with a focus on the mining value chain operations, integrated operations and value-based decision making. He has worked with over 50 mines in the past 8 years and has a deep understanding of all mining operational processes, technical systems and commodities. He resides in London.